Roses are red, Violets are blue, enjoy some free shipping because spreadshirt loves YOU! TAW Shop is having a free shipping sale so if you have that special significant other then get them that TAW shop item they have always dreamed of but only for a limited time only! This offer expires on the 3rd of Feb so hurry! We have been in the process of revamping and revitalizing Reddit and the process is virtually complete! Reddit is now back up and firing on all cylinders, if you feel that you as a division have something of interest that you want the world to know about (or at least the Reddit part of the world!) then let us at SOCOP scratch that itch and get the word out. For further information regarding this then please contact irakuta@taw.net for further info! 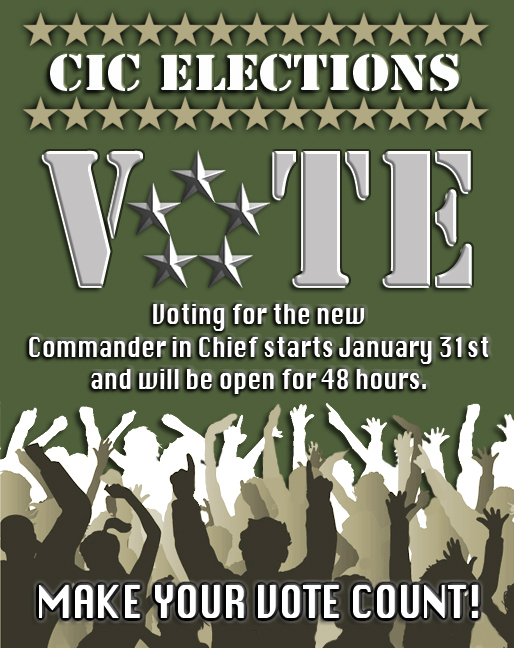 Here is the information that we promised for the upcoming CiC Election! We have text responses from all three candidates as well as audio recordings of interviews! Check it all out and see who you want to support as our next Commander in Chief! Listen to the audio recording of the TFO Meeting that includes the candidate interviews! Ladies and Gentleman it is that time of year again! Here we go with the CiC elections! WOOP WOOP! This will obviously be closed to everyone except CC members. This section, who do you think should lead us forward? TFO's this is your chance to nominate a candidate. TFO members can also second and third. See the election policy for details. This is your chance to quiz and interrogate your future CiC, ask them their plans etc and see what evil plans they have in mind for TAW! See the election policy for details. Questions come up CoC from members to TFO to CC. See the election policy for details. Election voting opened up for 48 hours. These dates aren't set in stone but are a guideline as to what you guys can expect over the next couple of months! Good evening ladies and gents, just a quick update that SOCOP has recently revived its steam group and twtter! Please do not forget that all important updates and notices will be posted on all our social media including twitter, facebook, steam and of course here! https://twitter.com/TAWgaming Is our current twitter page! http://steamcommunity.com/groups/TAWgaming is our steam group! feel free to like/follow and subscribe to any one of the above to stay up to date with what is happening in TAW!